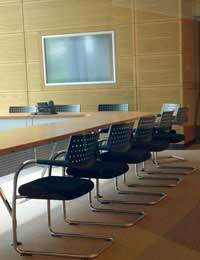 There are many uses for video conferencing facilities within a small business. Advantages include hosting real time meetings online that can also be recorded and then replayed when needed. There are also distinct cost benefits to be gained by implementing video conferencing in the workplace. Video conferencing is a technology method whereby two or more people can see and hear each other via computer, cameras and if desired, television screens. Video conferencing can be transferred by either telephone lines or via the Internet. Unlike Internet webcams, video conferencing uses a compressed video system that allows the viewers to interact with a smoother transmission of audio and video. Real time global meetings at anytime of the day. Recording facilities to allow playback at a later date. Video lectures to wide audience. Ability to see and talk to other workers onscreen. Cost effective use of technology in the workplace. Contact with home workers anywhere in the world. Many business owners will dismiss video conferencing outright due to the cost. But if your company has offices around the world then it makes more sense financially to use video conferencing facilities rather than to arrange actual face to face meetings. With video conferencing there is no wasted travel time and no hotel expenses to pay for as there would be for actual meetings. Video conferencing should pay for itself very quickly, and will be very cost effective if business owners take a long term view. There is a diverse range of choice when purchasing video conferencing equipment. Most small businesses will simply contact their telephone or Internet suppliers to arrange this service. However, you may be able to find cheaper options by comparing price via dedicated video conferencing suppliers through the Internet. There are many available and a number are world wide companies with years of experience in this field. The actual pricing of video conferences will vary, and will depend on which call contract you choose. Call pricing will also depend on how many workers at different locations are taking part in the video call. Small businesses can decide whether or not they would like to be charged by actual video call or by the minute. There are flat rate pricing plans or prices per minute for low usage users. The small business owner should consult the video conferencing supplier as to which option will be the most beneficial. Video conferencing is like any other small business technology; the prices are being continually reduced. Shopping around should guarantee the most competitive prices, and it is a large marketplace so do not be afraid to negotiate. There are distinct advantages when video conferencing is implemented in the sales and marketing sector. Video conferencing can allow selling and marketing of products to a much wider audience. Sales and marketing lectures can be held with question and answer sessions to a great number of people without actually leaving the office. The lectures can be recorded and played back at later dates, which is also beneficial for staff training or anyone who has missed the actual meetings. Working from home and outsourcing of work is becoming a way of life for a great number of people. Video and web conferencing has made home working even easier. The use of this technology means that home workers can keep in constant touch with the head office, and can relay and exchange information instantaneously. Video conferencing is playing a very real part in the small business office environment. It is now no longer just a gimmick but a much valued cost saving piece of technology. Business owners have come to realise that implementing video and web conferencing technology gives them a significant edge in the global business market.